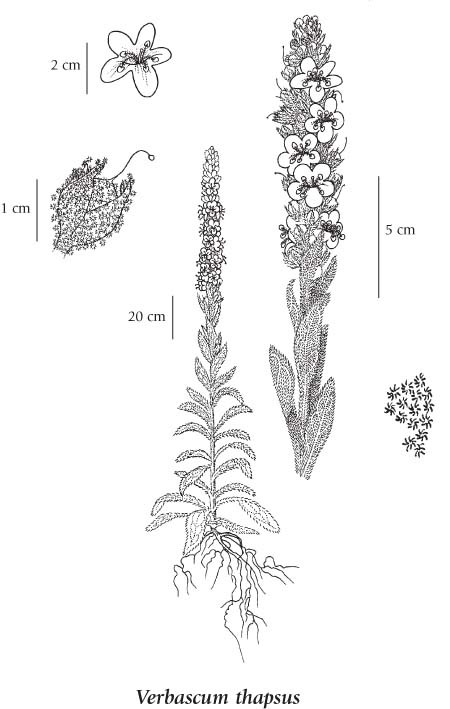 Robust biennial herb from a taproot; stems single, erect, 0.5-2 m tall; stem, leaves and inflorescence densely woolly with star-shaped or forking-branched, felted hairs. Basal leaves in a rosette, broadly lanceolate, 10-45 cm long, tapering to a stalked base, vaguely round-toothed to entire; stem leaves numerous, alternate, progressively reduced upward, becoming unstalked, with clasping leaf-bases decurrent along the stem. Inflorescence a dense, bracted, spike-like, terminal cluster, 10-50 cm long, of numerous very short-stalked flowers; corollas yellow, wheel-shaped, 1.5-3 cm across, 5-lobed, the lobes nearly equal, concave, the tube very short; calyces 5-12 mm long, hairy, deeply 5-lobed, the lobes lanceolate; stamens 5, the 3 upper filaments white- or yellow-long-hairy, the 2 lower filaments longer, smooth or nearly so. Capsules, broadly egg-shaped, 7-10 mm long, woolly; seeds numerous, longitudinally ridged. Dry roadsides, gravel pits, fields and waste places; common in S BC north to 53degreeN, rare north to 55degreeN; introduced from Eurasia.